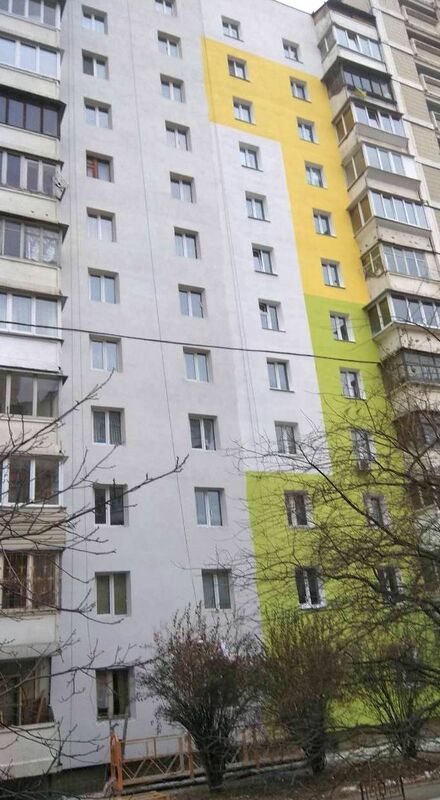 Kyiv home owners’ association (OSBB) ‘Aviator-17’ performed a facade insulation project of an apartment building located in Svyatoshynsky district of Kyiv within the framework of the Ukrainian Residential Energy Efficiency Financing Facility programme, also known as IQ energy programme, of the European Bank for Reconstruction and Development (EBRD). The project was financed by UAH 1.7 mln. loan from the programme’s partner bank OTP Bank. Under the terms of the programme, the association received an incentive payment from European donors in the amount of EUR 20,643 which is equal to 40% of project investment value. "Currently, the project, implemented by OSBB Aviator-17, is the largest for IQ energy programme and its partners in multifamily buildings segment. The amount of grant is calculated based on the value of investment into the main equipment and materials, auxiliary products and installation works. Some measures supported by the programme, such as the installation of heat meters, can be performed even during the heating season. The funds for grants are available for both individual housing owners and multifamily building co-owners’ associations. Do not wait for any additional approvals; you can join the programme right now", emphasized Oksana Bulgakova, IQ energy Programme Manager. "We made the insulation of the Northern facade, the coldest facade of the building. Even prior to completion of all works, our residents noticed that their apartments became warmer and more comfortable. The project took place under control of IQ energy engineers, which became an additional guarantee of its high-quality execution", said Zhanna Petrus, the Head of board of “Aviator-17” multifamily building co-owners’ association. As a reminder: IQ energy programme has been operating in Ukraine for more than two years now, providing individuals with an opportunity to make their houses energy efficient. And since April, 2018 Ukrainian OSBBs can also participate in the programme. IQ energy is supported by an incentive grant budget totaling EUR 15 million provided by the Eastern European Energy Efficiency and Environmental Partnership (E5P) and a technical assistance grant for programme implementation provided in equal share by E5P and Sweden. The size of grant for OSBBs under IQ energy programme is 40% of the loan/investment amount. The amount of grant is calculated not only on the basis of the cost of the main equipment, but also based on the cost of installation works, as well as the cost of auxiliary materials and the cost of design works, as long as they are all purchased with borrowed funds from the partner bank of IQ energy programme. The grant is paid in euro to the bank account of the borrower at the bank where the loan was received. IQ energy's website contains the Technology Selector with almost 7,000 energy-efficient products and technologies that can be purchased and implemented within the programme. In addition, at the request of representatives of OSBBs, the programme’s engineers will consider other energy-efficient solutions not currently represented in the Technology Selector within existing categories. The representatives of home owners’ associations who want to modernize their multi-family building with IQ energy programme are welcome to contact the programme via e-mail: osbb@iqenergy.org.ua. More information on http://www.iqenergy.org.ua/en/osbb. .
IQ energy programme was organized by the European Bank for Reconstruction and Development (EBRD) and is financed by the Eastern European Energy Efficiency and Environmental Partnership (E5P), to which the European Union is the largest contributor; a technical assistance grant for programme implementation is provided in equal share by E5P and Sweden. The total incentive fund assigned for IQ energy is 15 mln EUR. The goal of the programme is to provide financial support for energy efficient improvements in the residential sector of Ukraine. IQ energy hotline: 0-800-50-57-17.